Born in Paris in 1881. Worked in his father’s fabric design studio after completing secondary school. Trained as a tracer in his father’s firm. 1901; Gleizes exhibited early landscape paintings in an Impressionist style at the Société Nationale’s exhibitions. He wrote the book “Du Cubisme” together with Metzinger in 1912. 1914 Albert Gleizes was drafted to military service and travelled until 1919 to the USA, Canada, Cuba, the Bermudas and to Spain. In 1939 Gleizes moved to Saint-Remy-de Provence and attended to sacral murals. Etchings to Pascal’s “Pênsées”, several art theoretical essays and in 1952 the fresco for the chapel “Les Fontaines” in Chantilly came into existence. 1947 a large retrospective of Albert Gleizes’ work was shown in Lyon before one of the important precursors of abstraction died in the Provence in 1953. As a co-founder of the “Salon d’Automne” and member of the “Salon des Indépendants” Albert Gleizes had close contact to the artistic avant-garde. 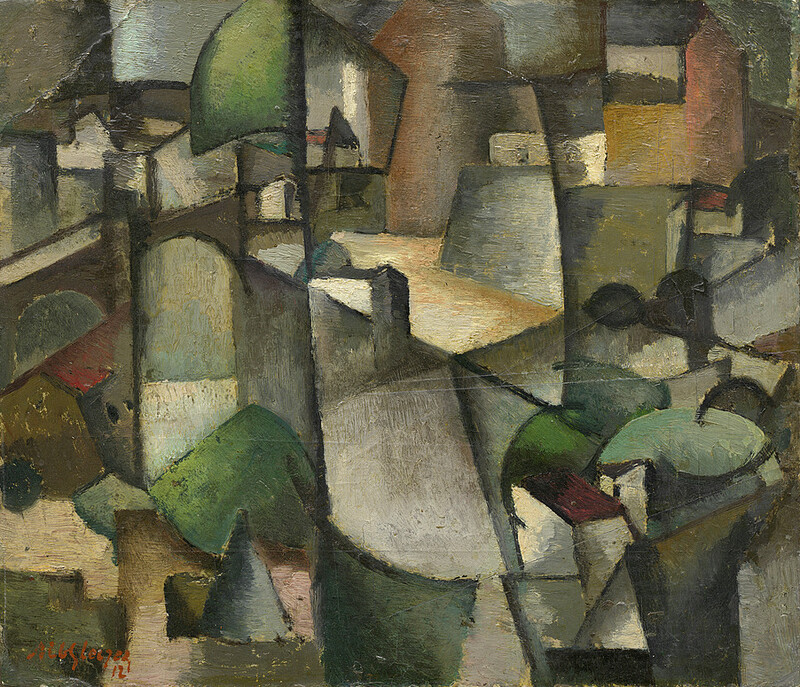 Influenced by Henri Le Fauconnier and Jean Metzinger he turned towards a geometrically simplified style in 1908-09 and produced the so-called “Paysages classiques”. He joined the Cubist circle around Robert Delaunay in 1910. Soon he discovered his own pictorial language, however, which dismantles the objects and re-organises them rhythmically – like in Futurism. Albert Gleizes’ art theoretical discussions were continued in the group “La Section d’Or”, which was founded by Jacques Villon the very same year. His ideas of creating a dynamics in Cubism inspired other painters such as Le Fauconnier, Roger de Fresnaye and Fernand Léger. After the war a religious change appeared in Gleizes’ works and he tried to transfer Christian topics into the Cubist image language. Albert Gleizes’ interest in the religious art of the medieval times led to the foundation of the commune of Moly-Sabata in Sablons in 1927, in which he hoped to revive the importance of manual skills. This utopian community of artists and writers scorned bourgeois society and sought to create a nonallegorical, epic art based on modern themes. The Abbaye closed in 1908 due to financial difficulties. In 1909 and 1910 Gleizes met Robert Delaunay, Henri Le Fauconnier, Fernand Léger, and Jean Metzinger. In 1910 he exhibited at the Salon des Indépendants, Paris, and the Jack of Diamonds in Moscow. The following year he wrote the first of many articles. 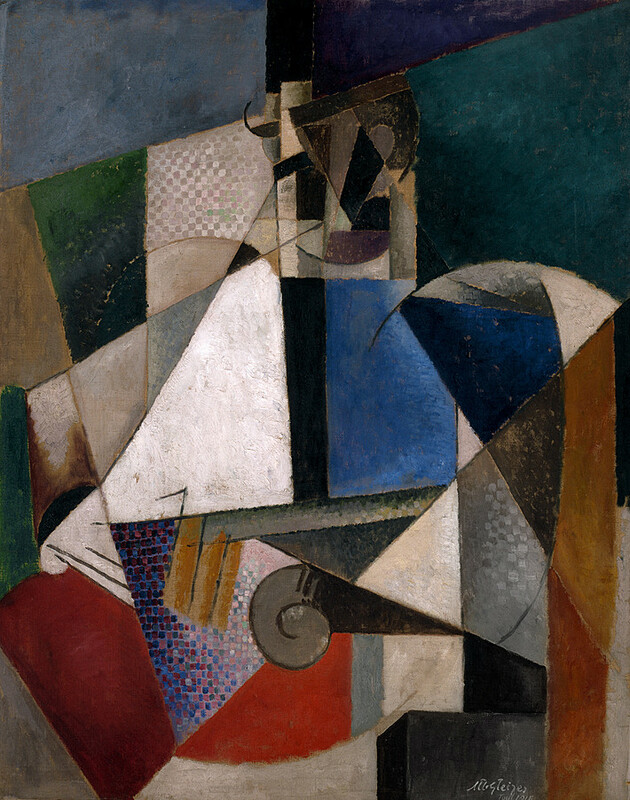 In collaboration with Metzinger, Gleizes wrote Du cubisme, published in 1912. The same year Gleizes helped found the Section d’Or. Beginning in 1918 Gleizes became deeply involved in a search for spiritual values, as reflected in his painting and writing. In 1927 he founded Moly-Sabata, another utopian community of artists and craftsmen, in Sablons. His book, La Forme et l’histoire, published in 1932, examines Romanesque, Celtic, and Oriental art. In an instance such as this, an analysis of the artist’s work through this frame becomes superflous. Despite attempts by a number of theorists to place some early Modernist artists under the Post Modern umbrella you’d be hard pressed; regardless of the breaking of a range of conventions, either via Modernism in general or Gleizes’s paintings in particular, to find a valid connection. His paintings had become abstract by 1915. While serving in the army from 1901 to 1905, Gleizes began to paint seriously. He exhibited for the first time at the Société Nationale des Beaux-Arts, Paris, in 1902, and participated in the Salon d’Automne in 1903 and 1904. Travels to New York, Barcelona, and Bermuda during the next four years influenced his stylistic evolution. 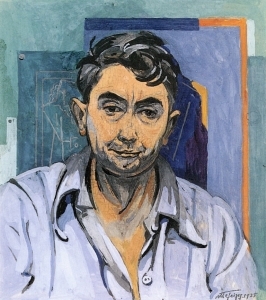 His first solo show was held at the Galeries Dalmau, Barcelona, in 1916. In the 1930s Gleizes participated in the Abstraction-Création group. Later in his career Gleizes executed several large commissions, including the murals for the Paris World’s Fair of 1937. In 1947 a major Gleizes retrospective took place in Lyons at the Chapelle du Lycée Ampère. From 1949 to 1950 Gleizes worked on illustrations for Blaise Pascal’s Pensées Sur l’Homme et Dieu. He executed a fresco, Eucharist, for the chapel Les Fontaines at Chantilly in 1952. Gleizes died in Avignon on June 23, 1953.